I have heard this over and over again during the last year. You need to have an autoresponder to build your list and you need to have your list to build your business. It seems like a lot of money to spend on speculation. Fortunately, Dennis Thorgesen turned me on to ListWire. It is a free autoresponder with some amazing possibilities. I think that I am just beginning to scratch the surface. For those of you that haven’t been following along, I started the Nove-Noga website a little more than a year ago. I have been writing programs of various types since the 1980’s but I did not know anything about HTML when I started this project. With W3Schools on the screen and an Idea in my mind, I set out to create the Nove-Noga site from scratch. When I discovered IBO Toolbox, nearly a year ago, Nove-Noga was just a barebones site serving to hold the few ClickBank links that I could find that served my purposes. 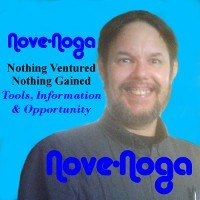 With the help and advice of my IBO Friends and Associates, the Nove-Noga site is beginning to take on a life of its own. As a one person operation, there is always more to do than there are hours in the day. It leads me to wonder if I should not have simply followed my own links and turned my attention to creating a viable freelancing income. When Dennis gave me the free ListWire Link, the first thing I did was create an opt-in form that I added to all of the Nove-Noga pages. My intention was to use it as a sort of newsletter to keep people informed of the changes to Nove-Noga. The response from my friends and associates at IBO Toolbox was very encouraging. The fix is fairly simple. I just need to put the monthly newsletter on my Must-Do list for every month. For those of you currently subscribed, (Thank You!) the newest message is in your box this morning. Thinking about the autoresponder and the possibilities it represents, I began to consider putting together a short series to go with my IBOtipList. I don’t wish to overwhelm anyone and I realize that my IBOtipList page can be overwhelming in and of itself. I had two choices, pack as much info as I could into a short series or drag it out while I shared everything I have learned in the last year. I know that I have a personal dislike for the email showers sent by some autoresponders so I decided to keep it to a simple seven message series. I just wanted to create something that can help the new people get off to a good start. IBO Toolbox has so much to offer that it can be difficult to assimilate it all at once. By taking it in smaller bites, it is a little easier to come to grips with what you need to do to take advantage of the possibilities of IBO Toolbox. As part of each message, I also included links to two of my Associates that represent value or demonstrate the variety of persons using IBO Toolbox to promote their business online. Now that I have the ListWire Autoresponder set-up and ready to help those who need it, I thought I would share this presentation with my more experienced friends and associates. I will be sharing the series over the next few days and I welcome any Ideas or suggestions that you may have. Being a do-it-yourself kind of person, it never occurred to me that there might be an alternative to setting up my ListWire Campaign by myself. It turns out that there is a paid service that can help you get your ListWire Campaign Setup for you. This can be a big help for those who lack the time or the confidence to set it up on their own. It’s all in the List. From the beginning of the Nove-Noga project, I have been working at ways to create my online business using *Free tools and opportunities. ListWire is an excellent free tool that can help you get started building your own list. Find a link to the *Free **GIMP Tool near the bottom. For Our Opportunity and Tools Page See Opporknockity. For Due Diligence, Google Search “Nove-Noga”.